(Nanowerk News) A new carbon nanomaterial -- the thinnest possible one-dimensional thread that still retains a diamond-like structure -- was created by the controlled, slow compression and decompression of benzene. The diamond-like structural unit consists of six-sided rings of carbon atoms bonded together in chains surrounded by a halo of hydrogen atoms (Nature Materials, "Benzene-derived carbon nanothreads"). 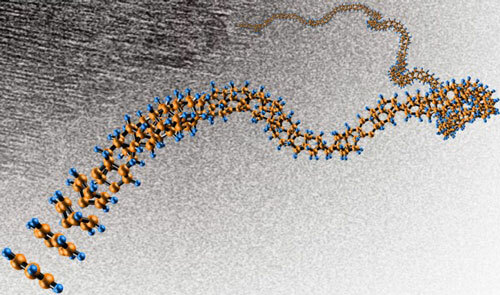 Rendering of carbon nanothreads as suggested by characterization techniques. Brown spheres, carbon; blue spheres, hydrogen. The rendering is superimposed on a transmission electron microscopy image of the carbon nanothreads. The image shows striations at a separation of 6.4 Å, extending for tens of nanometers. This model is consistent with x-ray and neutron scattering data as well as computational simulations. Based on computational studies, compared to conventional carbon nanotubes, the nanothreads produced by this method may have outstanding mechanical and electronic properties. The synthesis method developed in this work opens up possible variations, such as cross-linking or chemical functionalization (adding atoms or small molecules to the carbon nanothread that alter its function). These variations can lead to the design and preparation of materials presently unknown or impossible to make using existing techniques. Carbon nanomaterials such as fullerenes, nanotubes, and graphene have outstanding physical properties associated with their low dimensionality and graphite-like chemical bonding. The breakthrough discovery is the synthesis of one-dimensional, carbon nanothreads with diamond-like bonding only 0.6 nanometers in diameter. Computational modeling suggests that these nanothreads could be stronger than carbon nanotubes or conventional high-strength polymers and also extremely stiff. They are synthesized in macroscopic quantities by slow decompression of benzene frozen at high pressures and brought to ambient conditions. In contrast to the high-temperature, gas-phase synthesis used for conventional nanotubes, kinetic chemical control such as is employed in organic chemistry is used for the synthesis of the nanothreads. It may be possible to synthesize a whole family of diamondoid nanothread materials, even with crosslinking between threads, or with added chemical functionality, by this chemical approach, which is potentially more versatile than difficult-to-control gas-phase approaches. Using fabrication techniques developed based on this breakthrough, it might be possible to produce lightweight, ultrahigh-strength fibers for use in various structural materials in transportation systems and elsewhere. Kinetic chemical synthesis may also allow for nanothreads with mixed diamond and graphite-like bonding that that could have useful semiconducting properties.